I posted on my Instagram recently about how much I’ve been trying to get Jemma to like solid foods. So far we’ve tried rice cereal (which the doctor recommended), sweet potato, and carrot. I cooked and pureed some sweet potato and carrot myself but then realized that, on its own, it was maybe a little too thick. Someone recommended adding a little breastmilk to it but instead, I just bought some at the store. None of it worked and she hated it all. 😬🙄😥 A good friend of mine keeps reminding me that “food before one is just for fun”. Nevertheless, I’m inexplicably very excited for Jemma to start liking solid foods. Maybe because food is my thing. Also, I can’t wait to make her fun pureed fun combos. Like, a baby version of my fruit and veggie smoothies 😀 SOON! 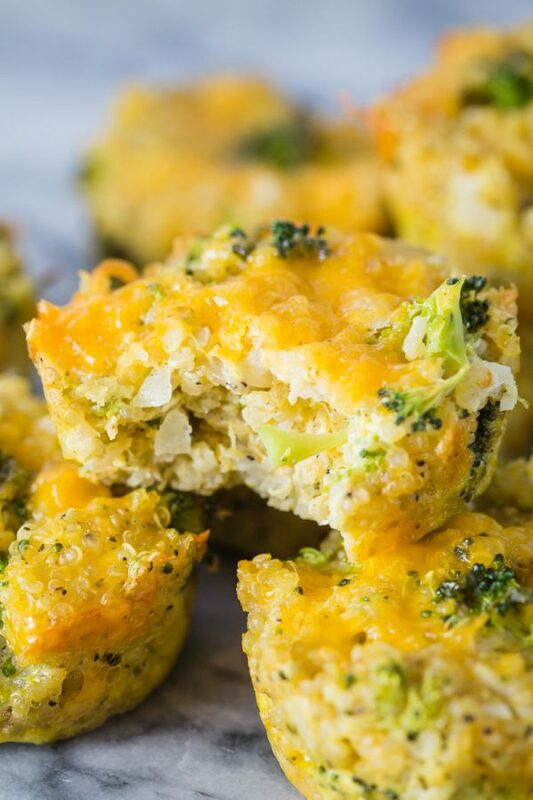 While Jemma is off hating anything that isn’t breastmilk, we’re going to dive into these Broccoli and Cheese Quinoa Bites! Mmkay? I promise you’ll like them more than my 6 month old likes carrot. PROMISE! Actually, I’m a pretty big fan of quinoa in general. I jumped on the bandwagon ~8 years ago when it first became hip and I’ve been obsessed with it ever since. 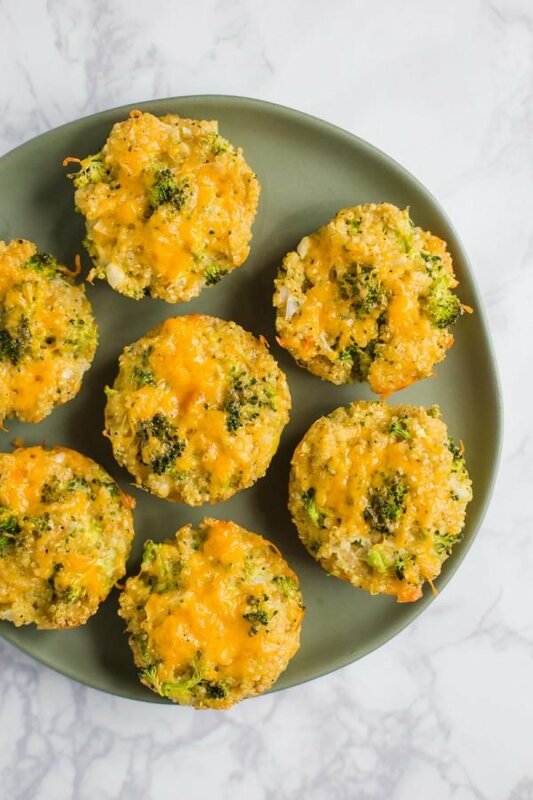 GIVE ME ALL THE QUINOA! 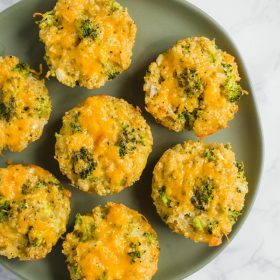 My first adventure in bite sized quinoa dinners came in the form of THESE delicious kale and quinoa patties. (you need to make those as well!). I would be fine eating these by themselves for dinner but they would also be great as a side dish! Pre-heat the oven to 350 degrees F. Generously grease a muffin tin with cooking spray. Bring the broth to a boil in a medium saucepan. Add in the quinoa, lower to a simmer and cook, covered, until all of the liquid has been absorbed. Stir every few minutes. Once done, take off of heat and let sit, covered, for 10 minutes. Fluff with a fork and then place in a large bowl to cool. 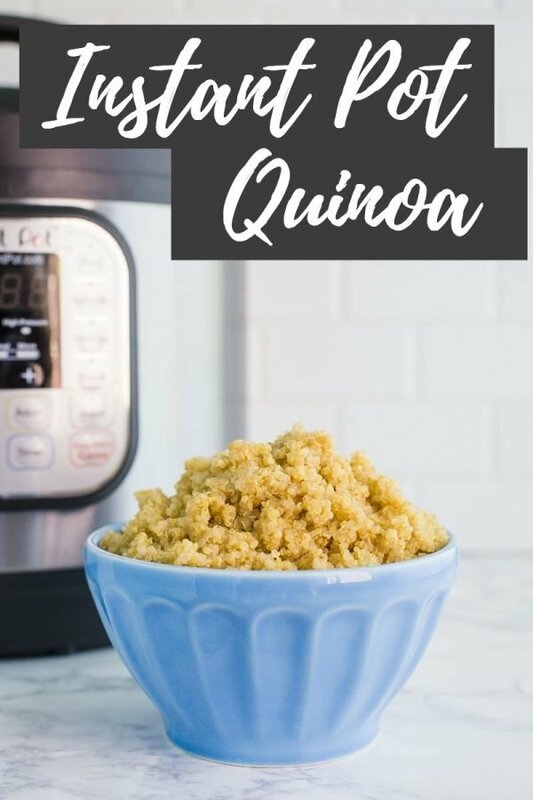 You can cook the quinoa in your Instant pot using THIS method as well! 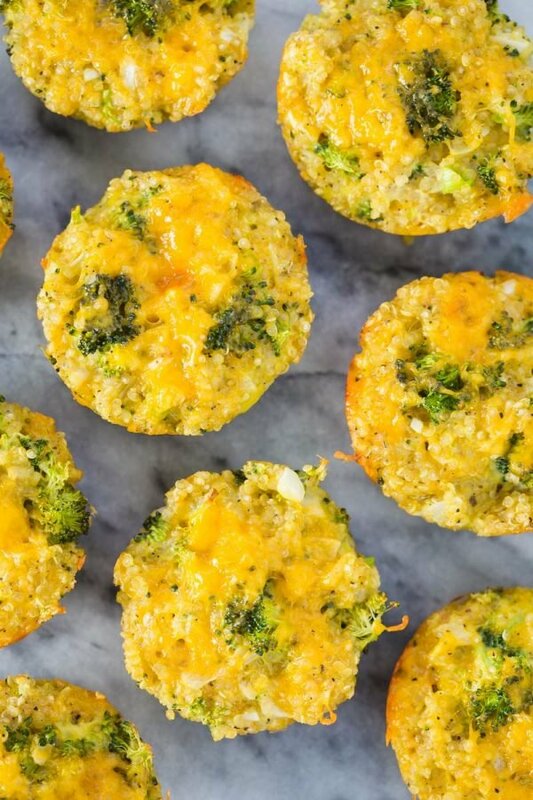 Once the quinoa is cool enough to handle, add in the broccoli, cheddar, onion, garlic, oregano, salt, pepper, and eggs. Mix until full combined. 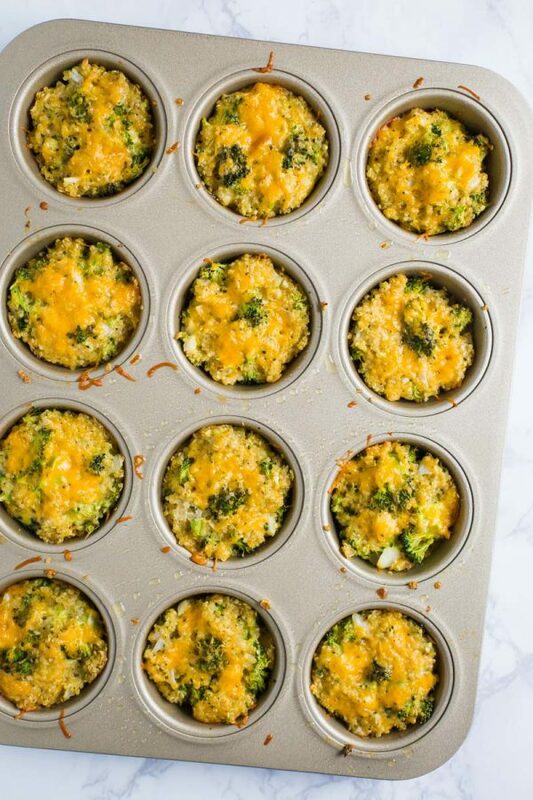 Divide the quinoa mixture evenly among the 12 muffin tin cavities. Top with extra cheese if desired. Bake in the oven for 20 minutes. Let cool slightly and ENJOY! I have begun a Keto way of eating. So I’m wondering if there is something I can exchange for the quinoa in the bites. 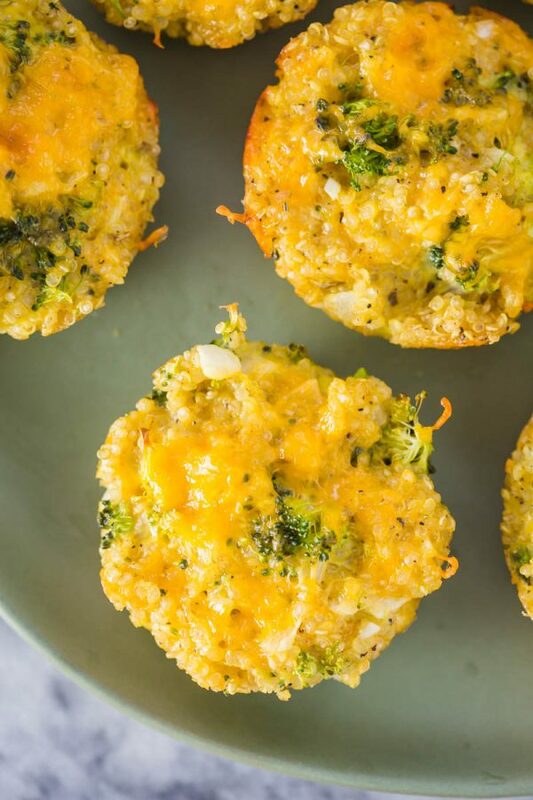 I will be making these this week as a side for turkey burgers!! I’ll let you know how they turn out! Super pumped! I want to grab one out of the picture and eat it NOW. I absolutely loved these! I hope they heat up good for lunch tomorrow. These will be in rotation at my house.